James Brodzik represents clients in Fair Debt Collection Practices Act (FDCPA) and other consumer protection related suits, as well as clients involved in Employee Retirement Income Security Act (ERISA) litigation. He also focuses his practice in the area of professional liability, where he defends doctors, lawyers, and accountants in malpractice and negligence claims. Mr. Brodzik also has extensive experience in areas of products liability, premises liability, and toxic tort defense where his representative matters extend from Fortune 500 companies to local municipalities and schools. 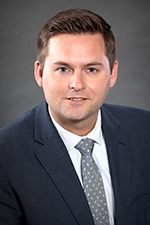 Mr. Brodzik joined Hinshaw & Culbertson LLP in May 2013. Previously, he was a summer associate at the firm in 2012. Prior to his legal career, Mr. Brodzik worked as a data analyst for ShopperTrak LLC, in Chicago, Illinois. While in law school, Mr. Brodzik was a member of the Dean's List and was an Honor Roll awardee. He was a recipient of a merit scholarship and of the Knights of Columbus Citizenship Scholarship. He received the Alternative Dispute Resolution Book Award for top overall student. In addition, Mr. Brodzik was a member and committee leader of the Disaster Relief Legal Association. Mr. Brodzik is a member of the Missouri Athletic Club. His hobbies include golf, film and travel. Mr. Brodzik has been active in fundraising for the Leukemia and Lymphoma Society, and volunteers for the Boys Club through Join Hands ESL Inc. He also volunteers as a Judge for Washington University in St. Louis Moot Court Competition.